North East bias is probably partially the deciding factor in this one. Terminal and Darpa are fairly even and makes for one of the more debatable battles on this card. I think they’re both battlers with something to prove and both hungry to earn a win for the friendly rivalry between their respective leagues. There’s a fair bit of hype around Darpa and I don’t think we’ve had the chance to see him at his best yet, but being on this card against Terminal should bring out his A game. Tofer is the worst battler on this card. For such a high profile line-up being heralded the best and biggest UK card for a while, Tofer sticks out like a sore thumb. 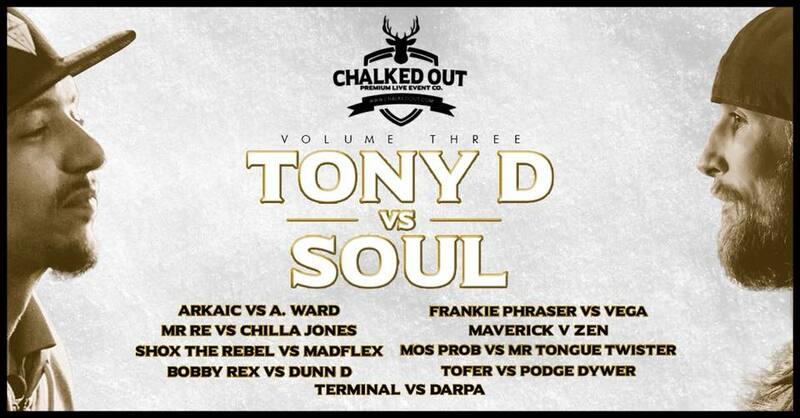 Podge isn’t necessarily the best battler on a card with Tony D, Soul and Shox but I see this as a bit of a mismatch. I expect this to be a stepping stone battle for Podge. He should be getting better opponents than Tofer. This is another debatable. My money would be on Mos Prob but we’ll probably not get a clear winner, and more so based around personal preference. Given that they’re both battle rap veterans, and have only battled sporadically in recent years at best, it would be overly surprising if there’s a little rustiness. North East bias again? I’m not sure that’s even relevant this time around. Maverick is on one of the hottest streaks in battle rap right now but is yet to face a serious challenge in an established battler. If this was on beat, Zen would probably take my prediction but apparently it’s acapella and so I’m not sure there’s much doubt that Mav is taking this – I don’t think he’s losing a round here either. Frankie’s writing is way better than Vega’s. Vega’s performance is usually better than Frankie’s – but as long as Frankie gets all of his material out he should be taking this. The run Frankie is on right now is impressive with just a few slip ups. Another few flawless performances and he’ll be mentioned in the upper echelons of UK battle rap, and that should be enough motivation for him to roll over Vega. Bobby’s loss to Villun at Premier Battles Match Day 001 puts this battle into a bit of obscurity. Prior to the Villun battle I had Bobby Rex taking this fairly easily. This should be a pretty fun battle because of Bobby and Dunn D’s friendship but I think the home-country advantage should have Bobby picking up the win. It’s just a case of whether the Villun result causes confidence issues or more likely Bobby becomes even more eager to bounce back. I hate to say this – because I’m probably going to end up being wrong but I think Shox’s 2018 is going to be counterpuntal to his 2017. It’s mostly because of his life away from battle rap. He’s proved in recent performances that he can show up when needed but a couple cancelled clashes and pulling out of Premier Battles with notions of taking a hiatus calls into question how focused he is on this battle. As a result, I’m predicting a Madflex win here. I personally feel like this is a slight mismatch. Mr Re isn’t exactly the hottest name in battle rap right now, but is getting a fairly big opportunity against an international in Chilla Jones. I’m not sure about the behind the scenes politics but I’d have thought the likes of Dialect, Gemin1 etc., would have been more deserving of the shot. Hot streaks come and go in battle rap though, so it’s not fair to solely judge on that. That being said, I don’t think Mr Re is good enough to pick up a W against Chilla. Up until I started writing this I had A. Ward winning but I’ve soon changed my mind after rewatching some Arkaic battles. This is probably the closest battler to call alongside Darpa and Terminal, and I wouldn’t be too surprised with a result either way. If they’re both at 100% though, I’d see Arkaic taking it. This is being billed as the greatest rap battle in UK history. Two of the greatest British battles going toe-to-toe in what is supposedly Tony D’s retirement battle. 18 months ago I probably wouldn’t have been able to call this, but now I think Soul has cemented himself as a level or two above Tony. Tony’s legacy is cemented but he’s not been numero uno for a while now – he’s barely top five. I can’t see past Soul here.